You’re thinking of proposing to your one and only, you know what to say, where to go, what to wear, what to take……..but you have only one problem! A big problem, the ring! You need the 411 on diamonds. This is the symbol of one of the most important proposals you’ll ever make in your life, so it has to be perfect! You have no idea about diamonds, prices etc. you need help! After all, diamonds are rare and can be very expensive; you want to pick the right one for your loves hand (and your wallet!). A little background on this super precious stone. Diamonds are billions of tons of carbon rock we know as ordinary coal, transformed by heat and pressure into the hardest, most brilliant and most coveted substance on Earth. Not very glamorous right? But once this rock gets into the hands of gemologists and jewelers, they are cut and polished to perfection and thus we get the world’s most valuable rock! For several decades now, a universal grading system for comparing diamonds has been in place, its cornerstone being the famous 4c´s; carat, color, clarity and cut. So for all you men in the engagement ring shopping dilemma, ask your jeweler about these 4 standards so you purchase the best diamond to fit your needs! A carat is divided into 100 points. For example, a 50-point diamond weighs 0.50 carats. But two diamonds of equal weight can have very different values depending on the other members of the Four C’s: clarity, color and cut. So, onto color. Diamond color is all about what you can’t see. 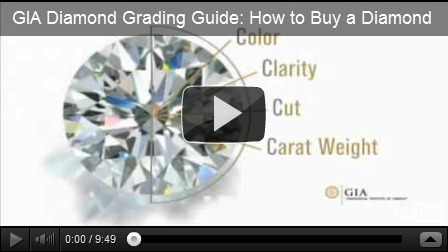 Diamonds are valued by how closely they approach colorlessness, therefore the less color, the higher their value. The exception to this is fancy-color diamonds, such as pinks and blues, which lie outside this color range. Clarity is all because diamonds formed deep within the earth, under extreme heat and pressure; they often contain unique birthmarks, either internal inclusions or external blemishes. Greater clarity = higher price. Lastly cut, which is what, gives a diamond its sparkle and brilliance. The most traditional for engagement rings is the round cut, but the marquise, pear, oval and emerald cuts as well as hearts, cushions, triangles and a variety of others are also very much worth looking at, and are all amazingly beautiful! Remember though, diamonds aren’t the only precious stone that would look amazing on your brides hand, but they are certainly the most sparkly! And what girl doesn’t like a bit of bling on her hand! Happy shopping soon-to-be-grooms!